Customs and Border Protection, which contains the Border Patrol, has a history of boarding buses and subjecting passengers to racial profiling in unjustified interrogations. Greyhound has always let it. After the incident, Greyhound released a statement saying that it was “required to cooperate with the relevant enforcement agencies if they ask to board our buses or enter stations.” Actually, as a private business, Greyhound has the Fourth Amendment right to deny CBP permission to board and search its buses without probable cause or a warrant. That’s why, six months ago, the ACLU wrote to Greyhound, urging the company to exercise its rights. Ten of our affiliates took a clear stand, echoed by tens of thousands of ACLU supporters: Greyhound should protect its customers from the racial profiling that characterizes Border Patrol interrogations and tell CBP that its agents need probable cause or a warrant to board a bus, protection that the Fourth Amendment guarantees. In our letter, we documented the experiences of Greyhound riders in Vermont, California, Washington, Arizona, and Michigan who had all experienced CBP boardings. The common thread in the reports was that CBP agents tended to single out people of color on the buses and did not provide reasons for their boarding and questioning. Unfortunately, Greyhound has completely failed to improve the situation for its passengers. Despite stating that it “opened a dialogue with the Border Patrol to see whether there is anything that can be done to balance the enforcement of federal law with the dignity and privacy of our valued customers,” no changes have emerged. While telling media that “we do not support or coordinate these searches, nor are we happy about them,” Greyhound has so far chosen not to exercise its Fourth Amendment right to deny CBP consent for boarding its buses without probable cause or a warrant. Without making this simple declaration, the company’s claims of protecting its passengers can’t be taken seriously. We’ve also encouraged Greyhound to inform all passengers of their rights during Border Patrol encounters, even offering to buy bus station ads that the company rejected as too “political.” In the interest of transparency, Greyhound could and should track and publish how often these boardings happen. 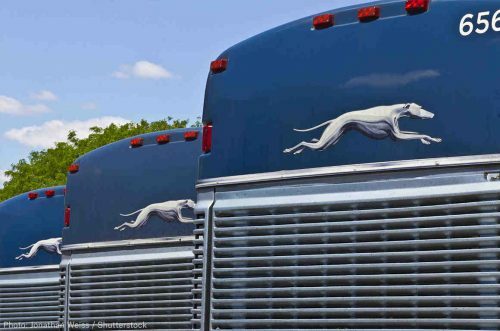 As far as we know, Greyhound has failed to implement any reforms that would protect the constitutional rights of its passengers and even itself. One bus station in Washington state is a microcosm of the border-wide harmful detentions and deportations that Greyhound is facilitating. Greyhound customers are frequently arrested for alleged immigration violations at the transport hub called Spokane Intermodal Center, which is at the outer edge of CBP’s “100-mile zone,” far from any international border. Since October 2012, Border Patrol agents have made nearly 200 arrests there. With more enforcement actions at bus stations since the Trump administration took power, we suspect nationwide arrest totals have increased dramatically, harming many immigrants and their families. Greyhound’s pledge that “we will continue to do everything legally possible to minimize any negative experiences” at the same time the company chooses not to deny Border Patrol boardings without legal cause is contradictory. The company’s inaction means that its customers continue to be unconstitutionally harassed and profiled based on how they look or speak while riding Greyhound.